Before you invest in a bachelor’s degree, find out which Michigan schools produce alumni with successful careers. These are the Michigan colleges with the highest-paid graduates. No matching entries found. Please refine your query. 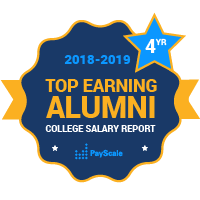 There are more than two-dozen four-year colleges assessed in PayScale’s report for undergraduate colleges and universities with the highest earning potential in Michigan. Some of the most noteworthy schools in the Wolverine State are Michigan State University, Eastern Michigan University, Ferris State University, and the University of Michigan — which was founded in 1817 as the first university to be established in America. Michigan’s status as an advocate for higher education was further cemented when it became the first state to guarantee all children the right to tax-paid high school education. The top industries in Michigan are Automotive, Manufacturing, Tourism, and Agriculture. Many celebrated alums representing a broad spectrum of industries hail from the Wolverine State including James Caan, Magic Johnson, Tom Sizemore, Bubba Smith, Lloyd Groff Copeman, Joanne Maguire, Steve Garvey, Eli Broad, Roverk Klark Graham, and Russell Kirk.